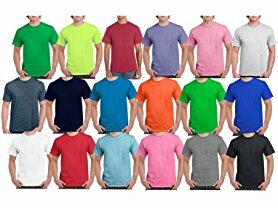 Right now these Gildan Men's Short Sleeve Tees 12-Pack are ONLY $25.99 (Retail $72.00)! That breaks down to be $2.17 each. Gildan is a leading provider of everyday quality family apparel, including t-shirts, fleece, underwear, and socks. Our Classic Short Sleeve T-Shirt provides a roomier fit and is offered in a wide variety of colors. Shipping is free with Amazon Prime or $5 Flat Rate.